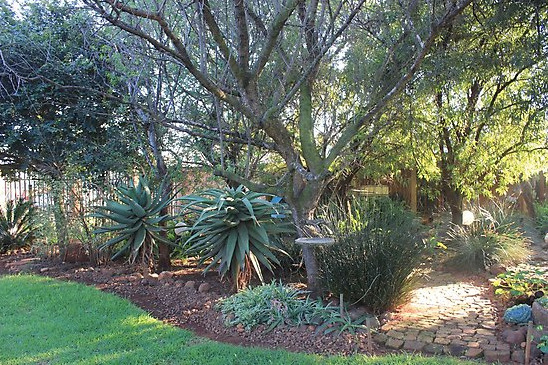 💕 The ramblings of a nature lover living on her little piece of African soil – an 8.5ha smallholding in Tarlton, Gauteng, South Africa. 💛 In summer I always enjoy an early-evening walk on our smallholding. No need to get in my car to find nature, I have 8.5ha right here to explore, hoping to see the Barn Owl or some Guinea fowl, but always enjoying the Bluegum trees and beautiful grasses and wild flowers along the way. Memories of Tarlton - Kiep's first egg! Kiep, my little pet hen, comes from Bantam stock, though clearly mixed with a variety of other chicken breeds, and she actually looks like a miniature Leghorn. 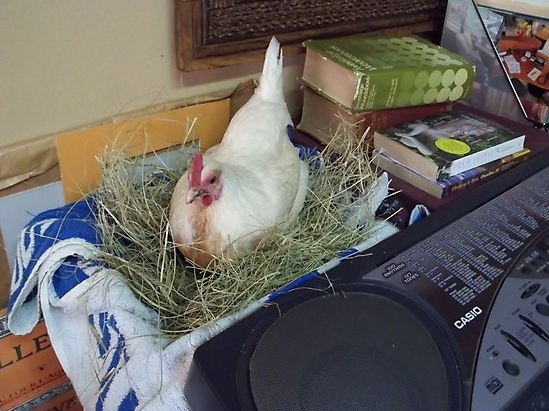 Here she is in her nest box in my studio (Tarlton, Gauteng, South Africa), laying her very first egg! Scratching around in her nest box, trying to settle in, all her feather’s erect and a glassy-eyed expression until the egg finally appeared! Kiep was reared in my studio, straight out of the egg, and to this day, 9 years later, she still wanders into my studio too spend some time with me. 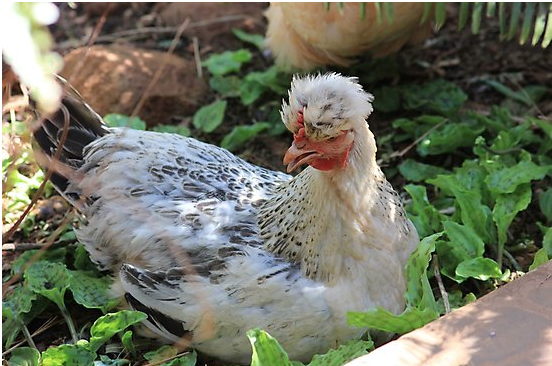 Bantam chickens have been domesticated for centuries. In fact, they are one of the oldest known domestic animals. Marco Polo wrote about banties in his journal. While all bantams are chickens, not all chickens are banties. All bantams are smaller than regular chickens and they share some unique personality traits. I personally think they have more personality than chickens do, are more able to care for themselves, and find more of their own food. They seem to keep the grasshopper population down better than other types of poultry! I haven’t seen a bug in my garden for ages since introducing chickens to my garden (Tarlton, Gauteng, South Africa) again early this year. Healthy bantams are curious. 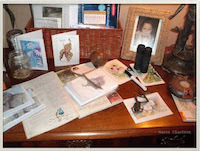 They will check out anything that seems unusual and loudly announce the arrival of visitors. I do not keep them locked in the pen, they roam as much as possible (a chicken’s raison de etre!) and have access to fresh, green grass, insects, and whatever else they find in addition to the feed I give them. Taken in my previous garden, Tarlton, Gauteng, South Africa. We’ve been having extremely hot weather and even my chooks have been gasping in the heat. My chickens have no problem with winter, but every summer you can find them listless in the shade, trying to cool off. Unfortunately chickens don’t bath in water (they have sand baths) otherwise that would be a quick solution to cooling off! But they do find shady spots for a bath in the cool sand leaving my garden looking like a volcanic eruption has taken place! Here Chi-Chi, the youngest of my pet hens, takes a break amongst the Leopard Lilies and ferns. 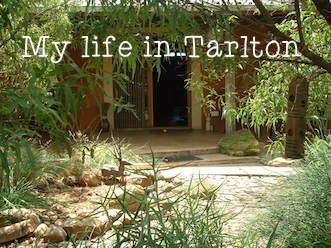 Memories of Tarlton - My garden is turning into a jungle! 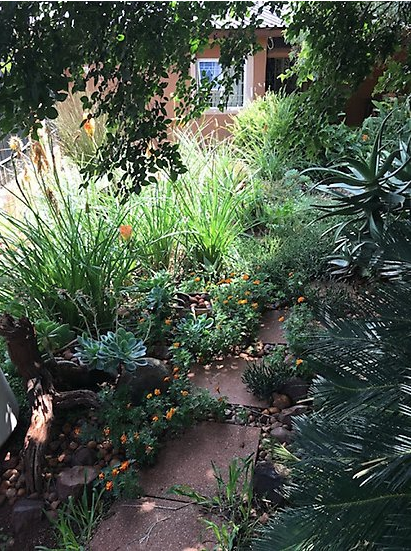 A path in my garden slowly getting taken over by all the plants after the good rains we had this last summer (winter here now in South Africa) and if I don’t do something about it, I’ll soon be crawling around in a jungle! There is nothing more exhilarating than checking up on your garden plants just as the sun is rising. 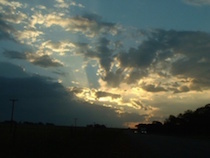 Everything is smiling in anticipation of another glorious day! And two Aloe ferox eagerly await their turn in the sunshine! Memories of Tarlton - Gettin' caught in the rain! 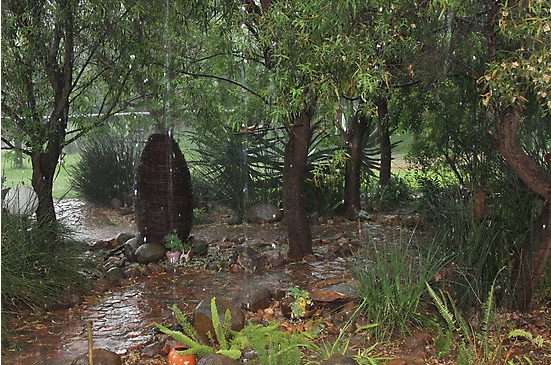 After months of drought, few experiences can match the sound and smell of falling rain – unless it is the exhilaration of being caught in it while working in the garden! Well, we've sold our smallholding, so this blog was a very brief sojourn! We're moving down to the North Coast, Kwa Zulu Natal (South Africa) and hopefully our new life there will be as exciting, ordinary, meaningful and wonderful as our 42 years in Tarlton (Gauteng, South Africa) has been. It's hard, difficult and heart-breaking to say goodbye to a life-time of gardening, chooks, running our business, sketching and painting the area and joys and sorrows, but life has a way of taking one in different directions and enjoying the journey is what it is all about, right? W&N watercolour on Bockingford 300gsm - unframed 12" x 8"- original for sale here. 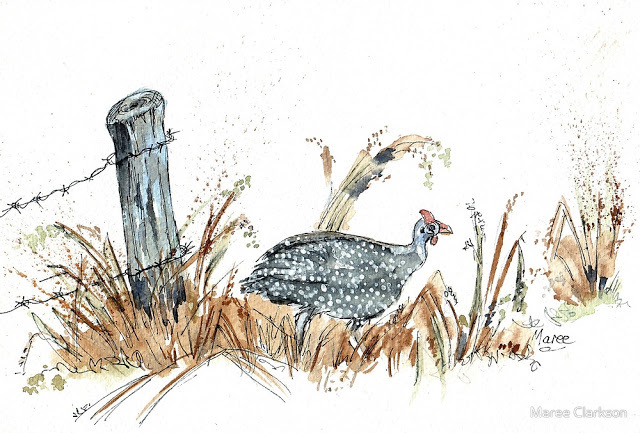 After years of not seeing any guinea fowl around our property (Tarlton, Gauteng, South Africa), I was lucky enough to have a visit from them a couple of days ago and I was totally thrilled! Taking some photographs also gave me a chance to do some quick sketches. Veldfire in Tarlton Fire in her eyes and ice in her words; the dancing fire angel chooses what you get. Tarlton (Gauteng, South Africa) is a farming area situated half-way between Krugersdorp and Magaliesburg, spread between the N14 and the R24. Originally a Blue gum plantation in the 1930’s, using the Eucalyptus wood for the mining industry and various other applications, it soon was highly sought after as an agricultural area due to the excellent ground quality and abundance of water. Tarlton has supported many flower and vegetable farms over the decades and also consists of mainly smallholdings of 8.5ha size where nature lovers tend to their little flocks of cattle, sheep, chickens and various other farming activities. Tarlton is situated in the Cradle of Humankind and is home to many caves, game reserves, guest houses and other tourist attractions, like the Maropeng Visitors Centre, where early remains of our ancestors can be seen. Tarlton has a railway station originally laid out on the farm Vlakplaats 160 I.Q. and some of the divisions of Vlakplaats are Vlakplaas, Reydal, Hillside, Groenplaas, Marabeth, Beckendan, El Jesee, and Wolwekranz. 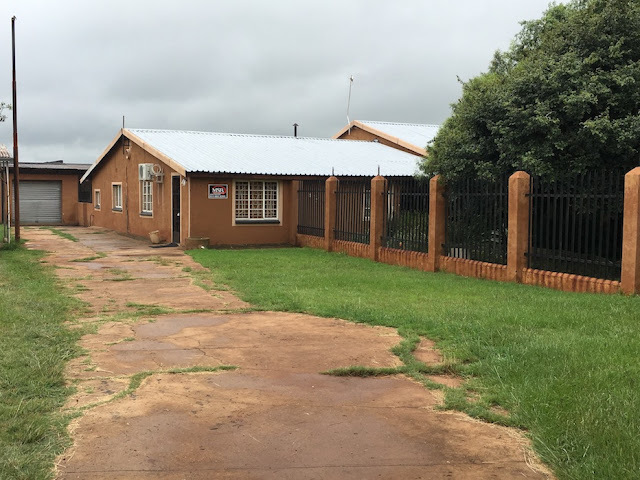 Tarlton also sports a church, two rural schools, an international jet car raceway, a post office, a police station, a filling station, a supermarket, a few flower nurseries, an air field and various other small businesses. Just before the second Anglo Boer War (1895 - 1902), L.S. Jameson (one of Rhodes’ ‘kindergarden’ members), departed from Pitsani in Botswana travelling through Boons and Tarlton on the way to Krugersdorp to meet the ‘reformers’. They were intercepted by General Cronje and his Boers and after a short skirmish over-night (Dec 31st 1895), at Krugersdorp, where Jameson lost approximately 18 men, they surrendered to Cronje at Doornkop on the 1st January 1896. Modern Tarlton now falls under the jurisdiction of Mogale City and is largely still a rural farming area, but with progress, many industrial enterprises are now moving in, threatening the little wildlife we have left. In the early 1970’s, there was an abundance of guinea fowl, hedgehogs, jackal, tortoises, snakes, chameleons, hares, Egyptian Geese, herons, cranes, Hadedas and various other small mammals, which are now rarely seen. I realise progress cannot be stopped, but we can all do our little bit by having wildlife-friendly gardens and leaving open spaces as safe passage for all of them. Africa is mystic; it is wild; it is a sweltering inferno; it is a photographer’s paradise, a hunter’s Valhalla, an escapist’s Utopia. It is what you will, and it withstands all interpretations. It is the last vestige of a dead world or the cradle of a shiny new one. To a lot of people, as to myself, it is just 'home'. Watch for Birds/Snakes/Beetles etc. ©Maree Clarkson. Watermark theme. Powered by Blogger.